Swayze was born and raised in Houston, Texas. A natural athlete, he excelled at any sport he set his mind to including track & field, football, and swimming. His mother was a local dance instructor who instilled his early love for ballet. After his dreams of a career in football were cut short by a high school injury, he turned his attention toward dance. In the early 1970s Swayze moved to New York City where he continued his training with the Harkness and Joffrey ballet companies. It wasn’t long before he began performing on stage in roles in Goodtime Charlie, Westside Story and as Danny Zuko in the hit musical Grease. 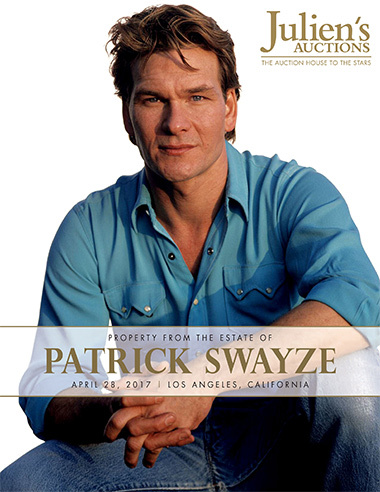 In 1979, Swayze starred in his first Hollywood film, Skatetown U.S.A. and subsequently appeared in The Outsiders, Uncommon Valor, and Red Dawn among others. Swayze’s athletic prowess, handsome good looks and emotional honesty allowed him to portray characters who were strong and confident, while at the same time compassionate and sensitive; a personage clearly reflected in the now iconic films Dirty Dancing, Ghost, Point Break, and Road House. In his personal life as in his movie roles, Swayze confidently faced every challenge head on. In 2008, after being diagnosed with cancer, he fought valiantly for nearly two years before passing away at the age of 57. 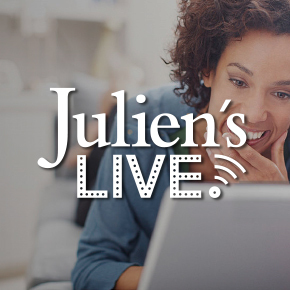 The collection offered by Julien’s Auctions will include such highlights as the legendary leather jacket from Dirty Dancing ($4,000-$6,000); two BMI Award certificates for the hit song “She’s Like the Wind” from the Dirty Dancing soundtrack, which Swayze co-wrote ($1,000-$2,000); his original script from his guest appearance on Saturday Night Live ($600-$800); a silk shirt worn by Swayze in Ghost ($2,000-$4,000); a custom built surfboard from Point Break ($4,000-$6,000) and many more items.